It’s Harvest Festival this Sunday at our local church and I’m busy in the kitchen and the garden making the most of our own modest harvest. It’s not as if we grow much but it’s always nice to have some food fresh from the garden. 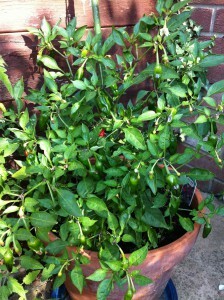 I always grow tomatoes, chilli peppers and fresh herbs such as thyme, rosemary and basil. By this time in late September the Tomato plants are heavily laden with green fruit which if left will probably never turn ripe. My solution to this is to turn the Tomato’s and Chilli’s into my Christmas Chilli Chutney I do this most years and give some away as Christmas presents but it’s so nice with cold meats and cheese that I have to keep several jars back for the family. It goes really well with cold turkey on boxing day and with the wonderful selection of cheeses my husband insists on each Christmas. I also like to pick all the Chilli Peppers and any that don’t go into my Chutney I carefully freeze for use throughout the winter months. I know you can buy chilli’s in the super market but they don’t have the variety, in my local supermarket it’s red or green. 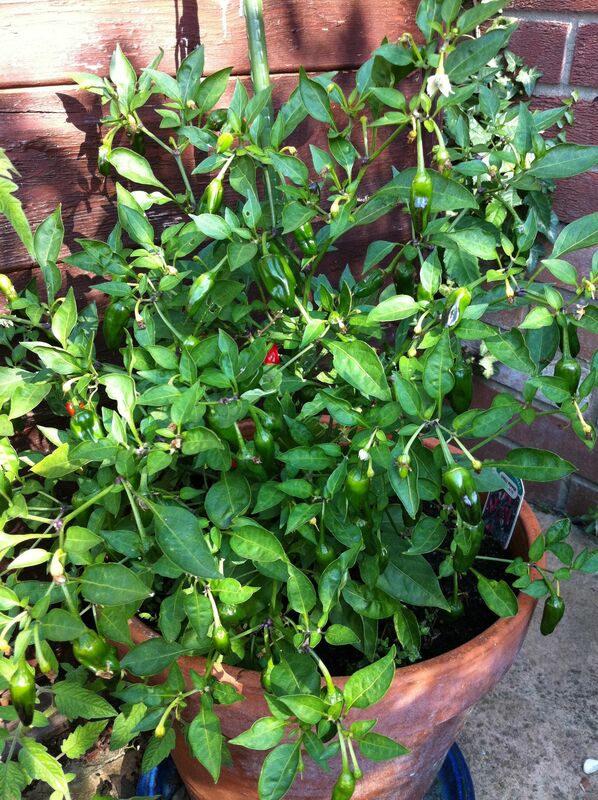 Growing your own chilli’s allows you to pick more varieties. This means that you can develop flavour rather than pure heat. So have a lovely Harvest Festival weekend and see what you can harvest and preserve for Christmas. 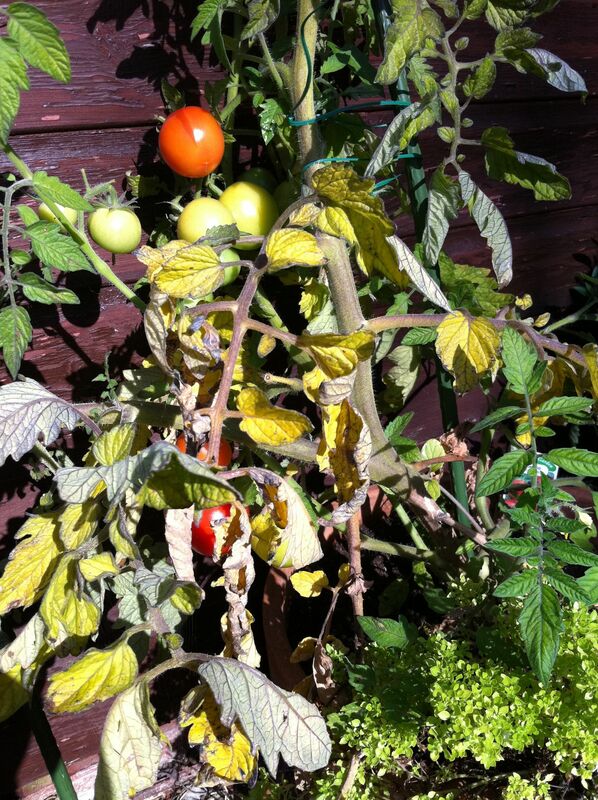 Looking at my tomato plants this morning there are lots of under-ripe fruits which as we start to get colder evenings probably wont ripen and risk going bad on the plants. With this in mind I think this is a good weekend to make my Chilli and Tomato Chutney recipe. The only problem is that this is so tasty with cheese and biscuits that you won’t have any left by Christmas. Click here for my Christmas Chilli and Tomato Chutney recipe. Have a nice weekend, Only 97 days to go! Here’s a great Chilli and Tomato Chutney Recipe to try this weekend. Just a quick post today to let you know that I’ve now added my Christmas Chilli and Tomato Chutney Recipe. If you’ve got lots of left over tomatoes from this years harvest this is a good way of using them. I also think making this and giving it to people as a present in a nice jar makes a lovely personal Christmas present. I think you’ll like this recipe and the chutney, it’s a bit special and there’s nothing like it it the shops. Family friendly: Christmas iced biscuits recipe. 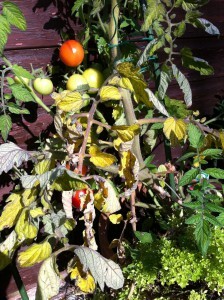 At this time of year if you have a garden there will be lots of fresh food around. I’ve been working on my Chilli Chutney recipe today as a way of using up some of the tomatoes and chillies we’ve managed to grow this season. It will be great to put a few jars away and enjoy this with the remains of the turkey and other cold meats at Christmas. I hope to get some time to type up this recipe and share it with you at the weekend. If you haven’t got a garden you can still spread the cost of Christmas by buying a few bits and pieces each week, for example jars of pickles, mincemeat, dried fruit for your Christmas pudding and Christmas cake etc, these all have a long shelf life and will see you up to when you need them at Christmas.